From Russia with love: that’s the Siberian, a glamorous native cat from the taiga of Siberia, a forested area with a subarctic climate that no doubt contributed to this cat’s long, thick, protective coat. See all Siberian characteristics below! As in every culture, the cats were prized for their hunting ability by householders and shopkeepers. They kept mice and rats well away from stores of grain and other foods. Siberians were first imported to the United States in 1990 and were recognized by The International Cat Association in 1996. The American Cat Fanciers Association accepted the breed in 1999, followed by the Cat Fanciers Association in 2006. The breed is gaining popularity because it has a reputation for being hypoallergenic—which may or may not be the case, depending on the individual person. This cat typically weighs 8 to 17 pounds — and sometimes more. The Siberian’s heart is as warm as his homeland is cold. He loves people and wants to be near them, so expect this affectionate cat to follow you around, including to the bathroom, and to “help” you with all of your reading, TV viewing, computer work and meal prep. Sitting in your lap while you comb his fur may well be the highlight of his day. When you come home from work, he might not have a martini waiting, but he will be pleased to tell you all about his day in quiet, pleasant trills and chirps, interspersed with a few meows and purrs. Guests will find him to be a genial host; this is not typically a cat who is shy in the presence of strangers. Besides being loving and attentive, the Siberian is also active and playful. He will instigate games of fetch by bringing you a favorite toy to throw. Any item can become a plaything for this clever cat, so keep jewelry or other potentially intriguing items out of his sight. Teaching him tricks is a fun and easy way to challenge his agile brain. Because of his heritage as a forest dweller, he likes playing with water—perhaps it’s a genetic memory of going fishing for his supper. Don’t be surprised if he enjoys splashing you in the tub, drinking from a fountain or faucet, or making puddles by batting his paw in his water dish. As befits a working and hunting cat, he’s highly athletic and you may find him balancing atop a doorway or propelling himself to the highest point in the room. In fact, Siberian coaches may well be the secret to the success of Russian gymnasts. Activity and noise won’t bother him a bit. His calm nature gives him the potential to be a therapy cat. If nothing else, he will be happy to snuggle with you when you’re down with a cold or other illness. And although he loves attention, he’s not needy and will wait patiently until you have time to devote to him. Both pedigreed cats and mixed-breed cats have varying incidences of health problems that may be genetic in nature. Siberians are generally healthy, but one problem that has been seen in the breed is hypertrophic cardiomyopathy. Hypertrophic cardiomyopathy is a form of heart disease that causes the heart muscle to enlarge. It is found in pedigreed and non-pedigreed cats. Siberians are one of the breeds that may be affected by this disease. The Siberian’s thick triple coat should be combed or brushed a couple of times a week to prevent tangles or mats. The coat will shed seasonally in the spring and fall, and you may need to groom more frequently during that time. A bath is rarely necessary, which is a good thing because the coat is highly water-resistant. It can be difficult to get a Siberian wet enough to shampoo him. Most of the Siberian’s growth occurs in his first year and a half of life. Your kitten’s breeder may recommend that you feed him kitten food during that time to make sure he gets enough nourishment. Keep the litter box spotlessly clean. Cats are very particular about bathroom hygiene, and a clean litter box will also help to keep the long coat clean. It’s a good idea to keep a Siberian as an indoor-only cat to protect him from diseases spread by other cats, attacks by dogs or coyotes, and the other dangers that face cats who go outdoors, such as being hit by a car. Siberians who go outdoors also run the risk of being stolen by someone who would like to have such a beautiful cat without paying for it. If possible, build your Siberian a large outdoor enclosure where he can jump and climb safely. 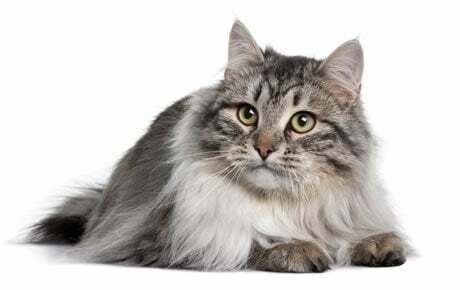 The Siberian is notable for having a long triple coat with guard hairs (the outer coat), awn hairs (the middle part of the coat) and a downy undercoat. He has an abundant ruff around the neck, thick but slightly shorter hair on the shoulder blades and lower part of the chest, and thick fur on the belly and britches (the upper hind legs). The undercoat thickens in cold weather. The coat comes in all colors and combinations of colors, with or without white. He looks powerful and alert, but gazes out at the world with a sweet expression. His head is a modified wedge with rounded contours—broad at the top and narrowing slightly at the muzzle. Medium-large ears are well furnished with tufts of fur. The nearly round eyes can be green, gold, green-gold, or copper. White Siberians or Siberians with white patches may have blue or odd eyes. The “hefty, hefty, hefty” slogan could have been written with the Siberian in mind. This is a medium-size to large cat weighing 8 to 17 pounds and sometimes more. It can take the Siberian up to five years to reach his full size and coat. His body is muscular and he has big round paws with tufts of fur and a thickly furred tail. The Siberian has a bold temperament, and nothing much ruffles his composure. These characteristics make him an excellent choice for a family with kids. No nighttime monsters will get past the Siberian on guard at the foot of a child’s bed. He is happy to live with other cats and cat-friendly dogs, too, as long as they recognize that he’s in charge. Introduce pets slowly and in controlled circumstances to ensure that they learn to get along together.